Today we’re welcoming Karen who is is an aspiring writer that used NaNoWriMo as a challenge to improve her novel-writing habits – with the help of her bullet journal. 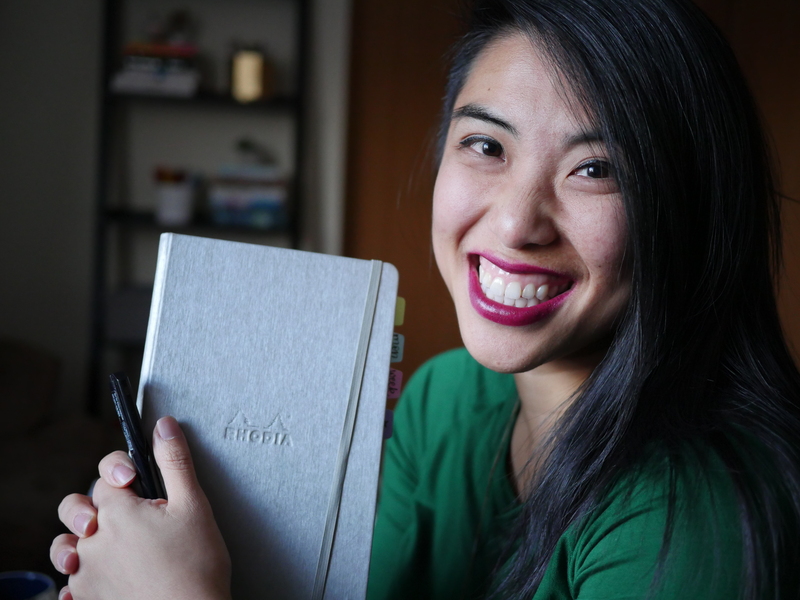 She created a Writer’s Bullet Journal to organize her efforts as a budding author. I love featuring guests that give us different perspectives, uses, and ideas for the bullet journal! I first discovered Bullet Journals in September 2016. I was getting the hang of using one when I decided I needed to use the Bullet Journal method to keep track of my writing. So I did what anyone would do, I raided the school supplies left over from when my kids were in high school. Score! I setup one of those black and white marbled Composition Notebooks as my Writer’s Bullet Journal. This was just in time to prep for NaNoWriMo 2016. I thought the black and white too boring and uninspiring, so I colored the front and then Covered the front with strips of packing tape to keep it looking pretty and so it wouldn’t fade or bleed off all over things. I used it for a few days and realized the back didn’t feel as smooth and nice as the front so one day I colored and taped the back as well. The bright colors make me smile and want to use the notebook. It all began with setting up an index, then I listed the days of November on front and back of a page so I could write down all the writing events associated with NaNoWriMo in my area. Then I added a bunch of pages to help me plan my novel: #Preptober Checklist, Plot Ideas, Characters, What If?, and Settings. Then I realized I should also create Word Count Trackers and I needed a spread or two for Blog Post Ideas. As I worked on learning more about how to plan and plot a fiction novel, I found things online that would help me. Instead of copying them into my BuJo, I printed them out and trimmed them to fit into the back pages where I used rubber cement to glue them in for ready reference. I discovered the 16 personality types of the Myers-Briggs Test, so I glued those in also. While planning my novel, I had trouble deciding which character traits to give to each character, so I found a list of character traits by Zodiac Sign and added that for reference too. This chart was handy because it told me which characters would get along well with which other character. I printed out the list of how many words I should have written each day in November and added that chart in what I now thought of as the reference section of my Writers Bullet Journal. Now I had an easy way to see if I was on track or needed to catchup with my word counts and I didn’t need to constantly do the math. I was feeling so great about how organized I was getting. I used my Writers Bullet Journal constantly. Once November was over and the frenzy to write everyday had passed, I noticed I only wrote a few days a week at best. So I made a second kind of tracker much like the one from November, but this time I wanted to tracker where I was and who I was with when I actually wrote. This helps me to understand that I get a lot more written during my Thursday night writing groups than I do when I am at home alone with many distractions. Note to self, make Thursday night writing group a priority. I also found my new Writer’s Bullet Journal was a great place to add quotes to keep me inspired. As I read various writing craft books, it only made sense to take notes in my notebook. Sometimes I would take the notes on regular paper and then copy them more neatly into the Writer’s Bullet Journal. Underlining key points with colored pens or markers made them stand out even more. When I attended a class on writing, I took my Writer’s Bullet Journal along and made notes in it. As it got close to another November, I realized I was quickly running out of pages in my Writer’s Bullet Journal, so I decided I wanted to make it last only until the end of 2017 so I can start a new notebook for the new year. To make sure this worked out, I drew out all the word count trackers and pages to track who I write with and where. There are only a few empty pages left before my reference section. I went into the Writer’s Bullet Journal in the composition notebook thinking it would free me to write whatever I needed to in it because it was such a cheap little notebook. I thought of it as my practice Writer’s Bullet Journal and told myself that when I finished it I would have all the bugs worked out and could then get a nice Leuchtrum 1917 to use for the next one, but after a year I think I would rather stick to using the composition notebooks for my Writer’s Bullet Journal. It is more of the size I want for the purpose and the fact that they can be bought so cheaply and easily encourages me to write more, learn more and record more in it. Those are all good things. If you have ever considered trying to write a novel, I highly encourage you to sign up for NaNoWriMo (NaNoWriMo.org) and whether you take that leap or not, please consider starting your own Writer’s Bullet Journal. Keep track of the number of words you write so you can see your growth as a writer. For several years, my goal was to become a year-round writer (not only in November). In January I decided I needed a new kind of tracker in my notebook, so I created the one below to track how many days each month out of the total possible I actually wrote, the average words per day that I actually wrote and the average words per day. You can see writing every day only happens in November for me, but I do write more regularly than I did back in November 2013 when I first discovered NaNoWriMo and my life was forever changed. It wasn’t until I began using the simple black and white composition notebook as a Writer’s Bullet Journal that I was able to achieve that goal. Write On! I am a writer, blogger, and bullet journaler who also likes to read, crochet, do genealogy, create forms in Excel and spend way too much time on YouTube. I have been married for over 31 years and have 2 adult children, a couple of fish tanks, a pet rabbit and a pet snapping turtle. You can see more of my bullet journals here where I share some lessons learned through experience. Email me at: LightHouseLifeLessons@gmail.com you can connect to all my social media through the blog. Love these ideas! Thank you for sharing. I use a very old and tired folder for my NaNoWriMo notes, but I love my BuJo and use it everyday so next year I might update my folder to a proper notebook for all my NaNo details.